Today, for the 53rd time in franchise history, the New York Mets will take the field for Opening Day. And thus begins my annual ritual of being disappointed from April until late September/October, with occasional blips of indescribable euphoria mixed in. 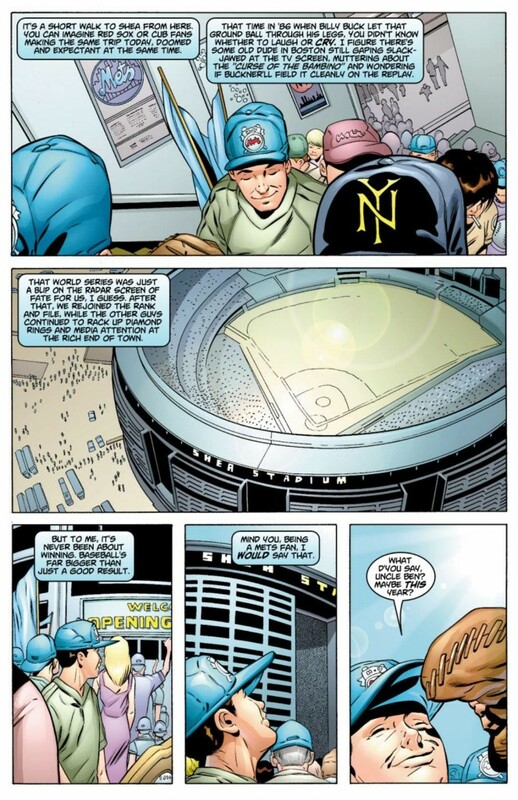 As I’ve alluded to in the past, baseball, and more specifically, the New York Mets, has been an integral part of my life even longer than Spider-Man. Before I became accustomed to rifling through a Spidey comic and then storing it in a bag and board for safe-keeping, my favorite thing to do was to go to the local smoke shop in my old neighborhood, drop 25 or 50 cents on a pack of Topps baseball cards, and become entranced with wonder as I sifted through those wonderful, sweet-smelling pieces of cardboard. I could barely read, but I was able to recognize some of the players, and of course I would always put aside all of my “Mets” cards because those were the “special” ones in every pack. Baseball was a way for me to bond with my father and my older brother. My father would take the two of us to the park and lift fly balls into the air for us to catch until he hurt his back when I was about 5 or 6 years-old. Throughout my teen years, I used to silently resent my father for breaking down physically and not continuing the ritual of shagging fly balls with my brother and I, as if it would have made that much of a difference in our social development. Now, that I have a son of my own, I wonder how I’m going to be able to physically do the things I once criticized my father for not being able to do. Every day, I roll out of bed and feel a new twinge in my back or my knees. I’ll be lucky if I can throw a wiffle ball with my son, no less swing a bat and launch a rawhide leather baseball into the air for him to catch. My favorite part of the baseball ritual was/is going to ball games. Shea Stadium, where the Mets used to play before they tore it down and built the terribly named Citi Field in 2009, was a dump, but it was OUR dump. Every season, I would journey out to Shea with some combination of my parents and my brother and watch the Mets play five or six times a year. There was plenty of miserable days at Shea for us, though if I think hard enough about it, I’m convinced I’ve seen more wins than losses. Still, one of my favorite moments of all time was being there for a late June game against the rival Atlanta Braves in 2000. The Mets were down 8-1 but the packed stadium stuck it out because we were promised a fireworks display afterwards. Instead, the Mets conducted one of their most outrageous comebacks in team history, scoring 10 runs in the bottom of the 8th inning. The scoring was topped off with a home run from Mets star Mike Piazza – a screaming line drive that looked like a laser beam. The crowd was so raucous, we could feel the stadium’s floor shaking and moving. The seats started swaying. I looked to my father as if to say, “is this safe? Are we all going to die in Shea Stadium tonight?” but he let me know that this was what Shea did when baseball was at its best there. 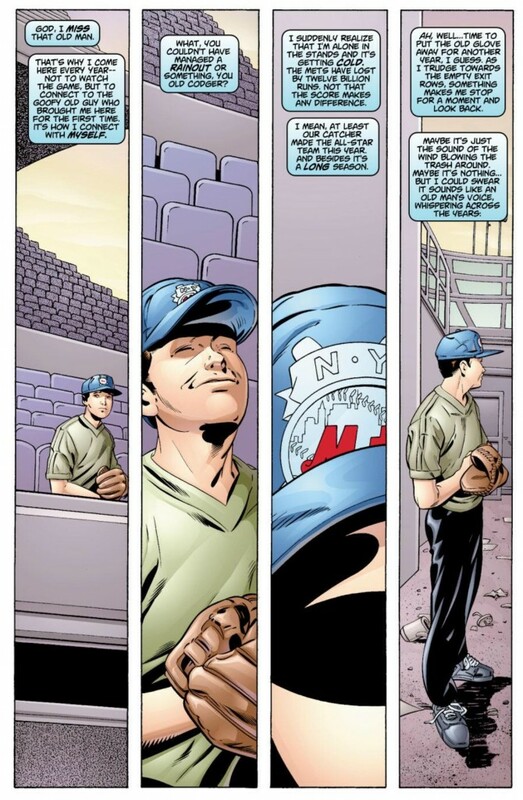 After using the first 600 words in an entry for my Spider-Man blog talk about baseball, I imagine that there’s a fair number of you who are totally glazed over and wanting to know where all the Spidey talk went. In the same vein, I have to think that the Paul Jenkins/Mark Buckingham story, “Maybe Next Year,” found in Peter Parker Spider-Man #33 (vol. 2), is one of those comics that certain readers totally connect to while others see it as inconsequential filler. In this story, Jenkins and Buckingham use the power of baseball – New York Mets baseball in fact! – to provide more context to Peter’s relationship with Uncle Ben. 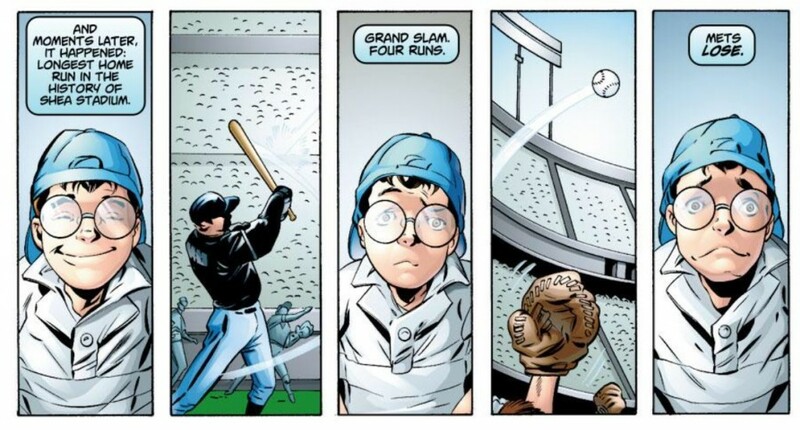 In this story, Ben first takes Peter to a baseball game as a young boy and within minutes he is completely transfixed. The Mets lose in spectacular fashion, discouraging Peter, but Ben offers some wisdom about brushing aside the losing and just enjoying the game for its fun and purity. The two continue to go to the Mets game on the same date every year, the Mets continue to lose in horrendous fashion and Ben always ends the day with his speech. Finally, there’s a year Peter is reluctant to go. Ben inadvertently guilts him into it and before he can start giving his speech, Peter cuts him off. It’s a sad and tense scene which is fortunately livened by the fact that the Mets miraculously win the game. Jenkins then cuts off the celebration by reminding us that three days later, Ben was shot and killed by a burglar. Peter continues to go to the ballpark each year, to honor Ben. As you might imagine, this comic has a lot of personal significance to me. Sadly, I never got around to reading it until I heard Jenkins speak about it during our interview with him for Superior Spider-Talk. 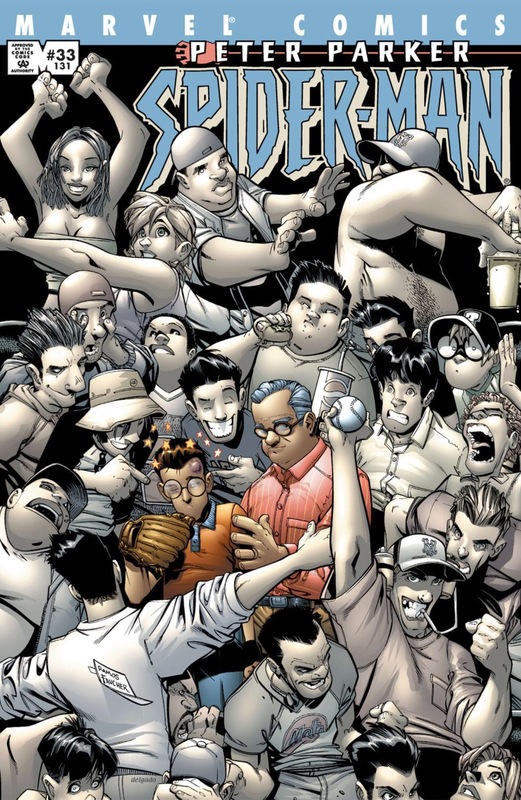 Late 90s/early 2000s Spider-Man was a real blind spot for me, as I was in college at the time and didn’t have the time or money to get to a comic book shop every couple of weeks. 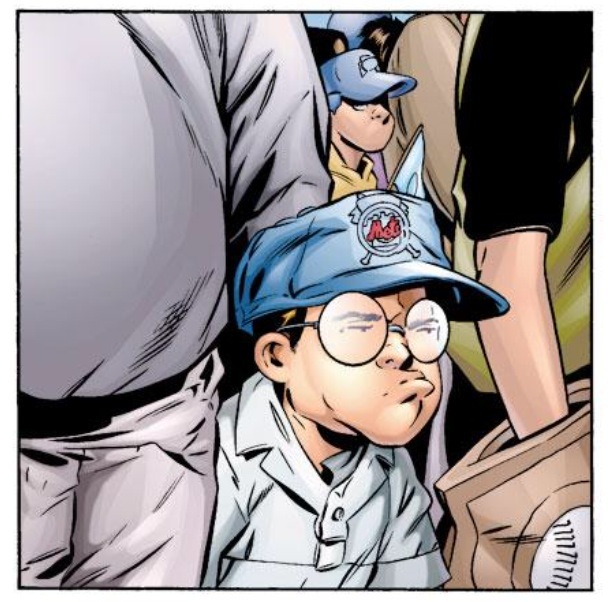 It didn’t help that Amazing Spider-Man was mired in the very blegh Howard Mackie run, giving me no reason to want to check out any of Spidey’s ancillary titles. 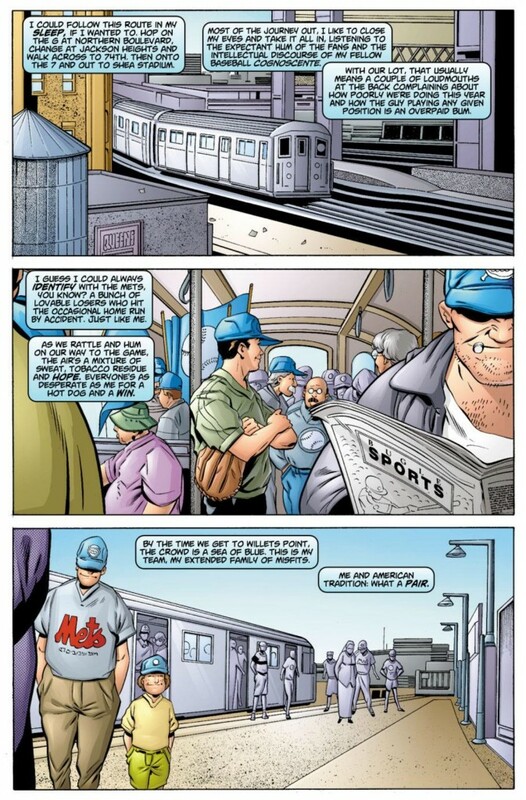 So you can imagine my surprise when I heard Jenkins discuss a comic about Peter and Ben going to a Mets game every year. The first thing I did after that interview was check out the Marvel Unlimited app on my iPad to see if it had been archived. After I found it, I immediately read it and became a Jenkins fan for life. What Jenkins captures so perfectly in this story is the emotional value of traditions and rituals. These shared experiences play a major part in connecting us and fostering stronger, richer relationships. For Peter and Ben, the baseball game was an annual bonding experience where the two of them could goof off and share a life lesson at the end. Baseball is certainly not a game for everyone, but there’s something about the nature of the game – for a game with so many rigidly designated rules, there’s something almost poetically anarchistic about the fact that the game could go on indefinitely if the score remains tied – that lends itself well as a literary metaphor. On a personal level, I find a tremendous amount of value in rituals and traditions. And yes, for me, one of my favorite rituals is Opening Day of baseball, and everything that comes before and after. For weeks leading up to Opening Day, I read about the players and the potential prospects for the coming year. I try to balance eternal optimism with grounded realism about my team’s projected performance. But once the gun fires and baseball’s regular season is underway, all of the prognosticating and speculating is out the window. I become fully immersed, flipping on Mets games at random points every night, regardless of the fact if the team is performing good, bad or worse. I visit with my father and talk about the great season one player is having, or how another guy is a “lousy bum” who couldn’t make a little league team. We complain about the Mets owners, the Wilpon family, for being cheap. I try and make time at least once a year, hopefully more, to meet my brother at Citi Field on a random Friday night to take in a game. And once my son is old enough to be able to sit through (most of) a ball game, I’ll make a tradition of going to the ballpark with him. At some point I anticipate I will no longer collect Spider-Man comics, either because I’ve finally accomplished my goal of owning every single one (and you can throw in the annuals too if you like), or because Marvel no longer prints them (can you collect digital files?). But Opening Day baseball is going to be a significant ritual in my life until the day I die. I’m so thankful that there’s a Spider-Man comic out there that marries these two loves in my life in a way that I can relate to and identify with completely. Oh man, this is such a tear jerker of an issue. It is sorta emotionally manipulative, but it is sooooo well done. Long time lurker on this site. Love this review. 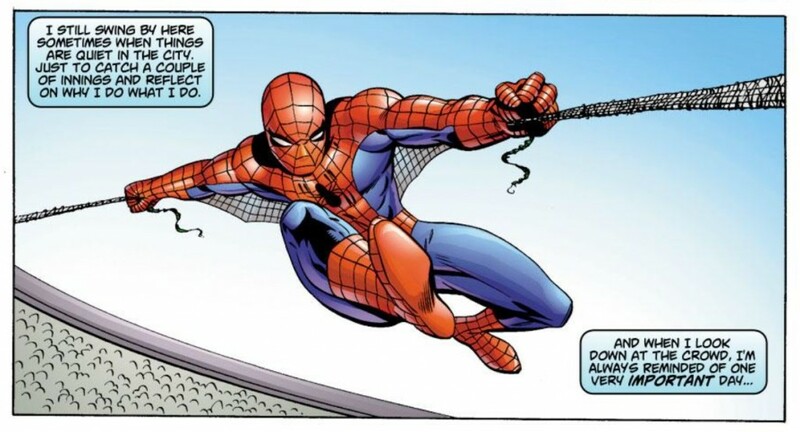 Also developed a blind spot to Spidey in the late 90s after the clone saga but this was one of the issues (along with JMS’ early run) that brought me back in. 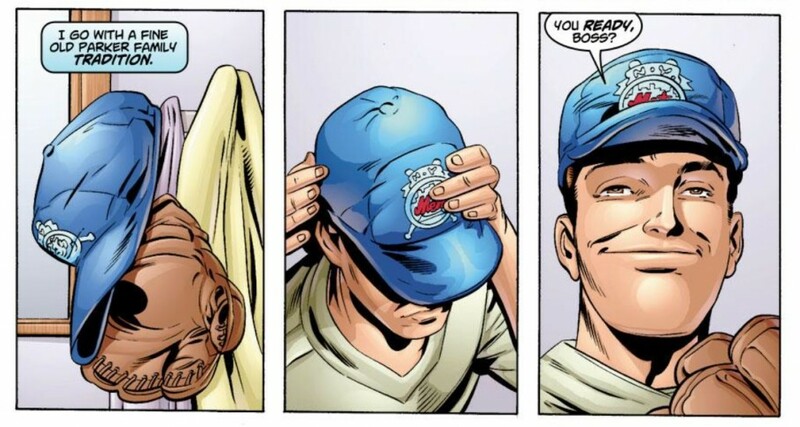 I’m a Queens kid and grew up a Mets fan too and this comic is one of my favorites of all time. Thanks for the reminder to read it again! With all the changes in the characterization of Peter, I enjoy issues like this that are completely character-driven instead of event-driven.